Hi! Jen again. 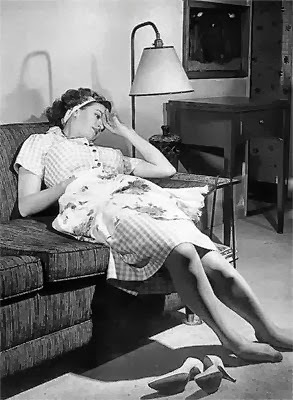 If you’re like me, this is how you feel most days. 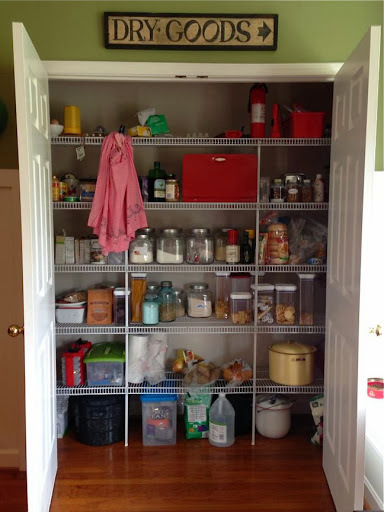 The thought of organizing the pantry is probably last on your list to-do and frankly, who cares if you can just shut the door when company comes calling! But if you have one lazy Sunday and can’t think of anything else you’d rather be doing…. Ok I laughed out loud too, but realistically it will make your life easier. For example, how many times have you been to the grocery store and bought the same thing twice because you didn’t see it buried under five boxes of pasta? Or there’s a strange smell permeating from a rotting potato that fell behind the 2 wide open stale bags of chips? The biggest reason for organizing your pantry in my opinion is to keep out pesky critters like pantry moths. And it doesn’t matter where you shop, those little pests find their way in and wreak havoc on just about everything. 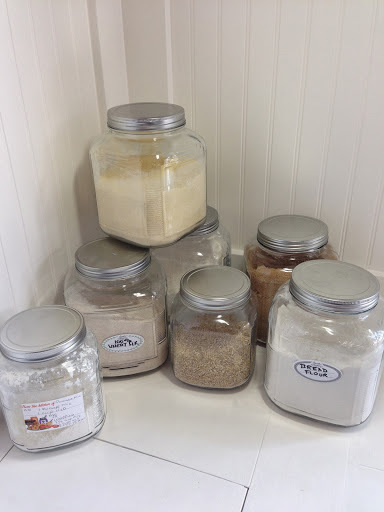 For about $6, you can find these great glass canisters for storing all your flour, sugar, and oatmeal. I like to buy pancake mix but hate keeping the box (remember you’re just asking for pantry moths to chew through the cardboard). I take a peel and stick label, write the instructions, and attach it the jars. 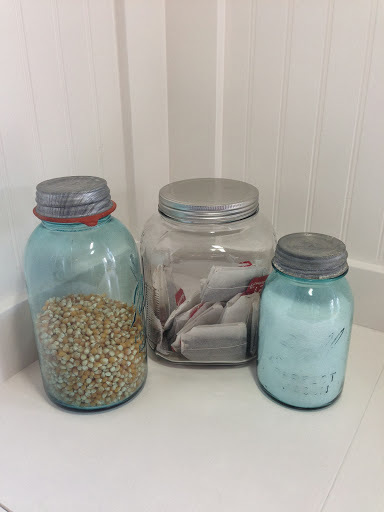 All these are easy to mark and date and you can use the same labels that you’d use for canning jars. And speaking of jars, I like to use vintage whenever I can. How cool are these old Ball jars!?! You can find these all day at your local flea market, garage sales, and antique stores. Tea and coffee also look great in giant clear glass canisters. You can get BPA free plastic containers at most stores. These cereal-sized ones also work great for chips. I’m just not a fan of boxes stacked in the pantry so I try to get rid of as many as I can. Not only does your food stay fresher but they just look nicer. 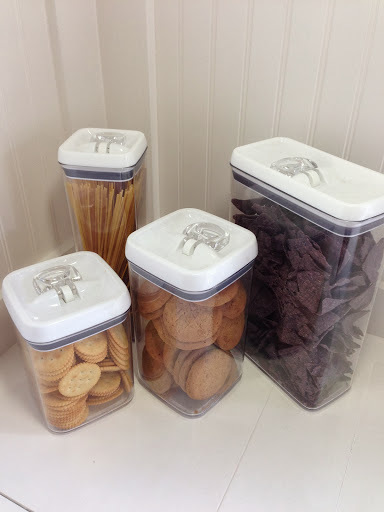 These Rubbermaid containers are great for storing granola bars, pop tarts, and oatmeal (a pantry moth’s favorite snack). I do a lot of wool dyeing and soap making so these supplies should be kept separate from all other utensils and food items. These totes are so inexpensive now and can be stored in the bottom of your pantry. 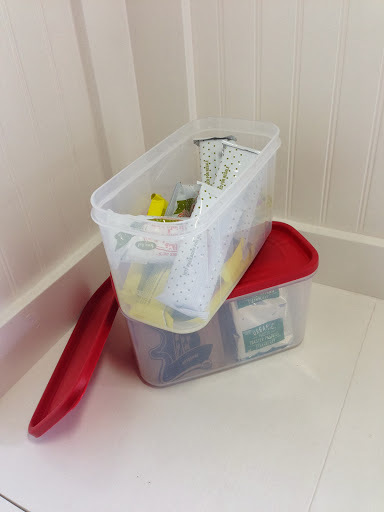 Another tip – bread box! People just don’t use them as much anymore but this red vintage 1930s one holds quite a bit and well, it just looks plain cool! 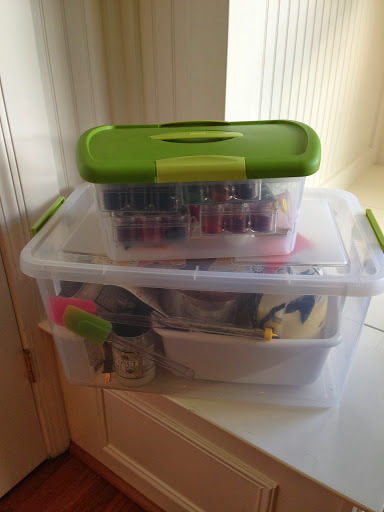 Hoped this inspired you to get a bit more organized and remember…. 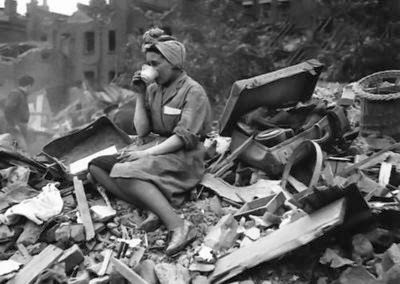 No matter how chaotic things get, relax, sit down, and have a cup of tea! !